It’s been proven that working out and dieting with a friend can increase your success rate. This is thought to be because you feel accountable to your buddy and don’t want to disappoint. Could the same concept work if the “buddy” isn’t human? Autom is a sweet little robotic diet coach that will help you stick to a diet and exercise routine by keeping track of your food intake and your exercise habits. The idea is that looking at a cute face and hearing a soothing voice is a more positive interaction than entering your data into a mobile or web-based application. Autom asks you what you’ve eaten and how much you have exercised, then offers some helpful tips about sticking to your healthy lifestyle. She’s wi-fi enabled so she’s constantly updated, and she learns from conversations with you. 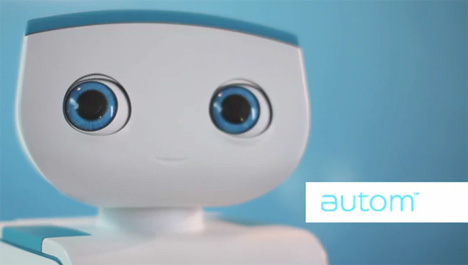 Like the Roomba before her, Autom is a groundbreaking home helper robot. 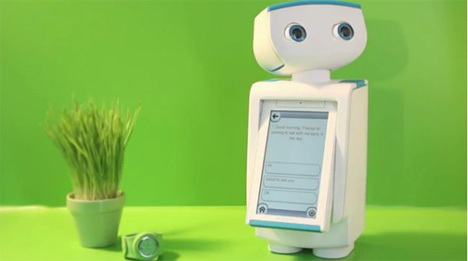 Users form an emotional bond with the bot and depend on her for diet information and encouragement. It may sound strange, but maybe a weight loss helper robot is exactly what some people need to keep them on the right track. Autom is available for pre-order now for $199 – but the weight loss service that she uses will cost you $20/month. See more in Robotics or under Technology. December, 2011.